Most of my readers know that I live and work in Canada, but I’m American by birth and citizenship. It’s been very painful to watch the increasing violence and public demonstrations of hatred in my country, which seems to have gotten worse. I literally weep for America. 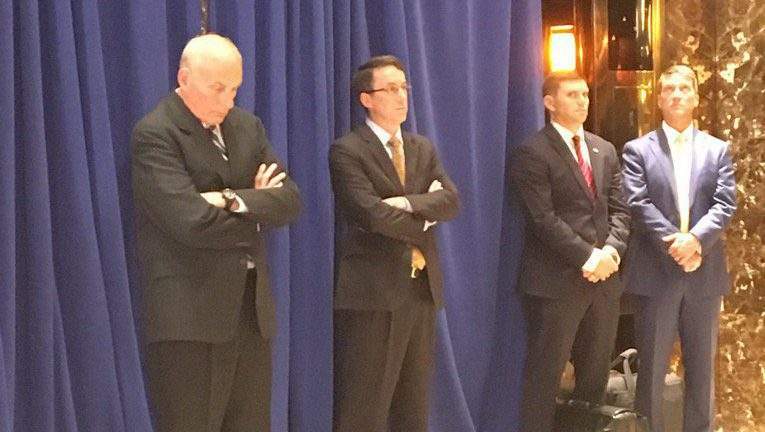 On the left is White House Chief of Staff General John Kelly standing in the back during President Donald Trump’s August 15 press conference. The New York Times article about this press conference was headlined, “Trump Gives White Supremacists an Unequivocal Boost“. Perhaps you’ve been in a moment like this. You’re in a group of people. And someone, a colleague, a donor or a friend, makes a comment that isn’t right. It could be an insult, a racist comment, a slur, a “joke” about a disability, a faith, gender or sexual orientation. And for some reason, at that moment, you didn’t say anything. You may have been shocked. It may have been spoken softly or swiftly or slyly. The uneasy laughter signals to you that to was insulting to some group. Or, it wasn’t your faith or gender or race that was being insulted, and you weren’t sure what to say. Maybe you looked down to the ground, to show you didn’t approve, to feel you weren’t part of it, or perhaps wishing you could disappear. Averted eyes are no longer enough to tackle bigotry and hatred. It isn’t enough for us – as fundraisers, as change makers, as defenders of injustice – to look down in protest. No. We need to raise our eyes and raise our voices and make clear we won’t to be complicit in those insults, slurs, jokes comments. You’ll find articles which may to tell you to walk away to signal your disgust, or confront the person, or take it as a teachable moment. I don’t believe it is enough to walk away. I don’t believe righteous indignation is the best way to go (especially if you aren’t blameless). And these moments are not teachable moments (since most people don’t like to be “taught a lesson” in public). Rarely is anything solved by a shouting match. Instead, we must raise our eyes and raise our voices. This may feel difficult. “Say something to a donor?” “Call out my boss? I just started my job.” Yes. In every case YES! And, it is true that you may earn the label of “that person who is sensitive about off color comments”. But isn’t that a label one should wear with pride? What is helping me is to have a few phrases at the ready to say. I’ve was in that situation – recently – with prospects at a sports event – donors I am cultivating toward five- and six-figure gifts. As I made introductions and they began comparing business practices, and comments surfaced. The comments turned to types of people with whom they have worked. The comments flew (there were two) and before I found my voice, the conversation had moved on. But the pit in my stomach stayed. I hadn’t acted or spoken quickly, and instead lowed my eyes. I’m asking you to make a stand next time something “innocent” or “small” happens. I’m asking you to no longer be a bystander. Hatred is rising world-wide and the time to act was yesterday, last month, last year but the best time to act next is today. And if you need to have a conversation about “all this stuff going on”, have the conversation with people who are within your circle of privilege. Don’t expect people of color or people with less power or indigenous people to process all this for you. Start the difficult conversations with your peer group (which may be fundraisers!). From The Root, “Maybe Now Isn’t the Time, Guys” about white people (or dominant culture people) needing to check their privilege. If you’ve never read “White Privilege: Unpacking the Invisible Knapsack” this is a good read and helps understand the unearned privilege from which many of us benefit. This thoughtful article “How to be an Ally to Indigenous People” posted in April 2017 has excellent resources at the end, and I’ve printed and posted the Ally Bill of Responsibilities. Bravely understand implicit biases you may hold. There is a series of tests that you can take on your computer, privately, from Harvard’s Project Implicit.